Here's a brownie recipe for game day created by Sooner fans living in Taiwan. Go OU! To avoid detection from Captain Carol of the Sugar Detectives Squad we used a French cheap chocolate that's about half vegetable oil so we could say there was no need to add oil or sugar to the recipe! We baked four mini Taiwanese sweet potatoes, then sliced and added two Hershey's kiss size French cheap chocolates into each sweet potato with powdered cinnamon and powdered ginger. blended the sweet potatoes with some milk. Then we used as the base for brownies, adding some vanilla, raw sugar, 2 beaten eggs, and a little baking powder and some flour, with plenty of pecans. 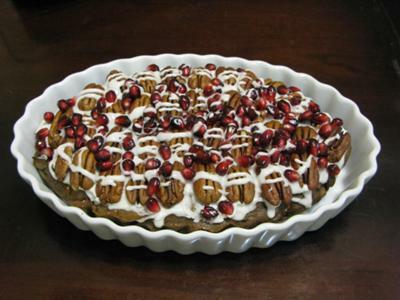 Topped with royal icing and pecans, drizzled with icing and then covered in pomegranate seeds.